HungryHeart is a hard rock band from Italy which was founded in the late 90's and finally in 2008 they released their self-titled debut album. The album was well received by fans and media, now it's time for no. 2! With One Ticket To Paradise the Italian rockers present another disk full of catchy melodic rockers and it's obvious that they are influenced by bands like Giant and Bon Jovi, add a dash sleaze to the mix - et voilá you get HungryHeart. The fast rocker One Ticket To Paradise is pure fun. Reminds me a bit of early Pink Cream 69 - a bit heavier - and even of Casanova... Singer Josh Zighetti offers whatever the song demands - from soft, almost spoken words to slightly aggressive parts. Guitarist Mario Percudani is showing off his skill here and there, but most of the time plays in a song supportive way. The ballad Let Somebody Love You will win you over with Mario's emotional vocals. Singer Josh just adds backings and let guitarist Mario Percudani sing this heartfelt tune. Boulevard Of Love make me think of L.A. Guns... A heavy, up-tempo rocker with a catchy guitar line - and a chorus which you soon will sing along! With Angela they present a heavy rocker, a song which sounds like a Giant tune - but also has HungryHeart in it! A country rocker they present with Love Is The Right Way, sounds like they listened to Blaze Of Glory more then one time... Or did Wanted Dead Or Alive inspired them? At Just A Little Closer their admiration for Bon Jovi shows through a bit too much...  Well, not a new sound or genre, but the songs are fun! With Man In The Mirror they honor Michael Jackson, but if you don't know that tune well, you won't think it's originally a pop song. Well done. 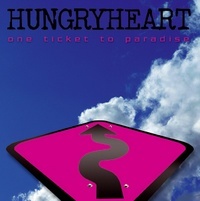 Fans of well-crafted melodic rock tunes with catchy melodies should check out HungryHeart at their MySpace!